Nobody has the photo of this "demo"? My copy is more clear looking on the front and has less xeroxed "noise" behind the texts. Unfortunately your copy looks like a home dub. Unfortunately your copy looks like a home dub. Not a big deal since I got it for very cheap. Always thought it was a dub, just needed to be sure since I'm selling my tapes (when I get a vinyl version of them). I'd need a picture of an original copy of the GBK "Goat Of A Thousand Young" tape. Thanks in advance. There are several editions of this tape so watch out. Urn demo above is definitely dubbed and xeroxed copy from the original. Mine features that typical kind of white tape that was used in Finland in those years by, among all, Demigod, Demilich etc, plus a card that is made of thicker than normal paper, it's not cardboard though. I don't know if yours is original, with DIY demos it's hard to tell many times. Discogs says it's supposed to be a white tape. Anyone know if some copies were dubbed like this? If you ordered it from me (looks like the same Maxell tapes I used) then it's real deal. I bought master CD and remaining cover sleeves from Hammer member. 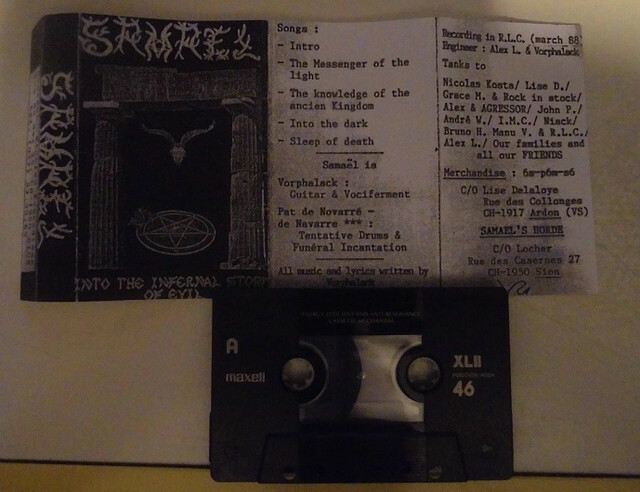 Copies came on all different kinds of tapes, as covers + master cd-rs were distributed. Exactly. There is no rule what tapes they could be. Lesson for everyone who takes Metal Archives/Dicogs little too literally.